My eyes brimmed with tears, one of those moments so intense I wanted to make it end, to run out into the safety of the hire car, the road and the twenty-first century. Yes, I know it was all fiction and none of it really happened, but L M Montgomery’s Anne Shirley figured as large in my childhood as the flesh-and-blood friends I met in school every day. And here I was, in this beautiful house, fitted out with its simple and functional furniture, but with lace everywhere – over the mantelpiece, over the tables, in the bedspreads, exactly as it would’ve been in her time. Anne was here, and Gilbert, and Marilla, and Rachel Lynde, and all the others. I’d travelled over three thousand miles for this and probably would never return. I took a deep breath and carried on. 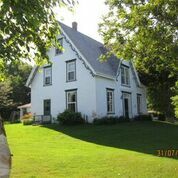 The Anne of Green Gables Museum is at Park Corner, on the north coast of Prince Edward Island, at a Gothic Revival farmhouse called Silver Bush, the former home of author Montgomery’s Uncle John and Auntie Annie Campbell. The first Campbells settled in this house in 1776 and the family lives here still, managing the Museum, which appears on Canada’s Historic Places Register and Prince Edward Island’s Register also. 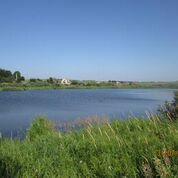 Although the real Lake of Shining Waters is just down the hill from the main museum building, this is not Green Gables, but Silver Bush, as featured in two of Montgomery’s other books, Pat of Silver Bush and Mistress Pat. It was in this house, which she called the wonder castle of my childhood, that Montgomery felt comfortable, not in the official ‘home of Lucy Maud Montgomery’ in the village of Cavendish a few miles away, which is advertised in tourist literature. The Museum has two storeys. You enter (like Mrs Rachel Lynde in the first pages of Anne) through the kitchen, passing the leaded range to pay at the desk (in summer 2015, $5.50 for adults and $2 for children). 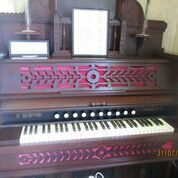 You move through into the lacy Edwardian parlour, where a clock ticks loudly and lugubriously and you see the small organ which was played at Montgomery’s wedding in 1911 to Presbyterian minister, Ewan Macdonald. You think about small children, sitting still on hard chairs, in their best clothes – hopefully with puffed sleeves – longing for Sunday to end. A letter in the parlour, written a year before the author’s death in 1942, thanks her nephew for sending $10, because, she tells him, she doesn’t have enough money for the nursing care she needs, even though by this time, Anne of Green Gables was enjoying huge popularity and Montgomery would have been earning from her many other books. 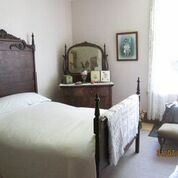 Upstairs are a family bedroom, a child or single person’s room and a hallway, where first editions of Montgomery’s books are on display – not just the Anne books, but a selection of her twenty-two novels, and the short stories she used to submit to magazines in the days before Anne. You may touch these faded volumes, even read a little. Hanging on the wall is the crazy quilt Montgomery stitched as a teenager, using any scraps of fabric she could find, and which she finished only after the fashion for crazy quilts had passed, but, as she wrote in her diary, she had had the ‘joy of making’  – a typically upbeat and stoical comment. Born in Clifton (now New London) in PEI in 1874, Montgomery’s mother, Clara, died of tuberculosis when the author was twenty-two months old. Mounted on the same wall is a journal entry, in which the author relates how, as an adult, she encountered a friend of her mother’s, who tells her how Clara entreated her to come and see her baby because ‘little Lucy Maud is so sweet today’. This is what brought me to tears in the warm yellow afternoon sunshine. There is a danger that the whole of Prince Edward Island will be subsumed by the commercial opportunities offered up through Anne of Green Gables and her creator. Everywhere you can buy red-haired Anne dolls, stay at several different Green Gables motels, eat at Green Gables cafes, bathe on the Green Gables Shore (the Island’s north facing beach), and, in the Homburg Theatre in the Island’s capital, Charlottetown, see Anne of Green Gables: The Musical, which has been running continuously since 1965. 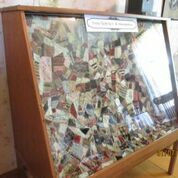 For more information about the Anne of Green Gables Museum, visit http://www.annemuseum.com.